Midnapore is one of the old centres of oriental learning. During the rule of East India Company initiative was taken to impart Western Education in this District. In 1834 Midnapore Zilla School was established which was upgraded to Entrance standard in 1857, in the year of the great Indian Mutiny. The F.A. Course was introduced in 1873 at the School and the School was raised to the status of a Second Grade College. The School and the College remained under the same management upto 1887. Law courses were introduced in this College in 1892. After which some changes occurred in the teaching programmes of the College. In 1916 the B.L. course was abolished and I.Sc course was introduced. 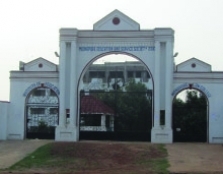 In 1922 pleadership course was abolished and B.Sc course was introduced.In 1997, during the 125 year celebration of the college, the Governing Body of Midnapore College took initiative to establish a Law College at Midnapore.Accordingly the Principal of Midnapore College approached to the State Government for permission to establish a Law college at Midnapore.The State Government of West Bengal by an order bearing No. 484 – Edn (CS), dated 31.03.2000 issued permission to the Principal of Midnapore College to establish a Law College styled as Midnapore Law College strictly on self financing basis. Midnapore Law College was thus established by Midnapore College under the stewardship of Sri Mukul Ranjan Ray who served Midnapore College as Principal from 1982 to 2001.The Vidyasagar University authority granted affiliation to Midnapore Law College to teach both Three Year LL. B. & Five Year B. A. LL. B. (Hons.) Courses with the approval of the Bar Council of India. This decision of the University was communicated to the Principal of Midnapore College on 17th July, 2000. After this the Bar Council of India was approached to grant approval of affiliation.On obtaining the approval of affiliation from the Bar Council of India, Midnapore Law College started admitting the students in both Three Year LL. B. & Five Year B. A. LL. B.(Hons. )Course from the session 2002-03. The Law College started functioning in one academic building of Midnapore College, named as Netaji Janma Satavarsiki Siksha Bhavan, within Midnapore College premises. In 2003, Midnapore Law College was sifted to its own campus at Jharnadanga, Rangamati near Midnapore Railway Station.On 30th May, 2003 Midnapore Law College obtained permanent affiliation of the Vidyasagar University. The Bar Council of India also accorded permanent approval of affiliation to Midnapore Law College on 17th July, 2004. The University Grants Commission also recognized the College under Section 2 (f) as communicated through the letter of the UGC, bearing No. F. 8 – 98/2008 (CPP – I) dated 22nd May, 2008.